NEW HAVEN, Conn. — Support and solidarity has been overwhelming for Nury Chavarria, who took sanctuary at the Iglesia de Dios Pentacostal church on July 20 rather than be deported and separated from her four dependent children, all U.S. citizens, one with cerebral palsy. Her courage in refusing to allow her family to be broken apart has sparked state and national response. Donations of food and other necessities and assistance for her children on a go-fund-me page have been pouring in. Just 36 hours after Chavarria began sanctuary, a diverse crowd of over 250 from across the street and across the state, including clergy and elected officials, filled the empty lot next to the church in the Fair Haven neighborhood for a vigil and rally. Every speaker emphasized to the Chavarria family that they are not alone. A common theme, reflecting the spirited and powerful gathering, was that this is just the beginning of a new level of unity and solidarity to end deportations and win a fair and just immigration policy. “I want you to know, Nury, that New Haven is with you,” said Mayor Toni Harp, who was elected this year as president of the national African American Mayor’s Association. 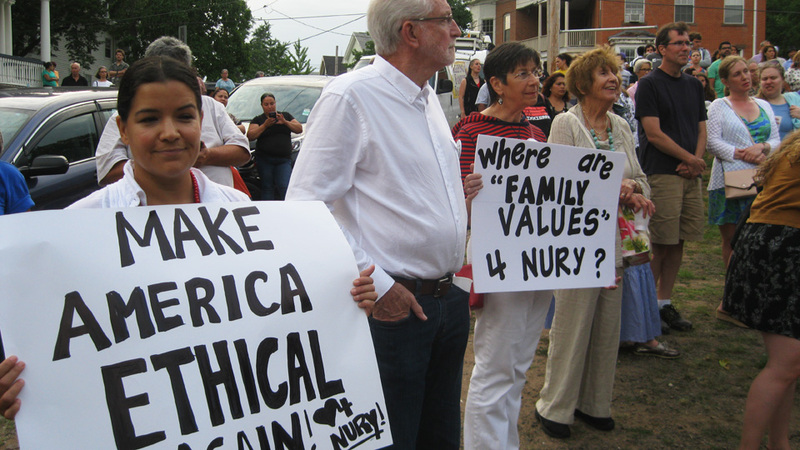 Calling the treatment of Chavarria and her children “cruel and inhumane,” Harp said she is “standing in protest to work together for solutions, for justice for Nury. “It is a foreign concept to me that a woman who has lived in Connecticut 24 years, worked in Connecticut, raised a family in Connecticut, must now leave Connecticut — her home, her job and her children — to satisfy discrimination and baseless fear in the hearts of some Americans,” said Harp. Mayor Harry Rilling of Norwalk, where Chavarria and her children live, assured everyone that his city is providing the necessary services to ensure that the children can stay in their home, have food on the table and continue their education. “I too, am ashamed of what our immigration laws are doing to this wonderful woman,” he said. At one point Chavarria briefly came out to the fence surrounding the church to express her appreciation to everyone. “Si Se Puede,” was the chant in response. Chavarria left Guatemala 24 years ago at age 19 seeking asylum in the U.S. She did not receive asylum but stayed, working as a housekeeper and raising her children. She has no criminal record, and has consistently complied with required annual visits to the office of Immigration and Customs Enforcement (ICE). When Chavarria went to ICE for her annual check-in this year, things were different. She was denied the usual stay of deportation and asked for further documentation. She provided that along with communications of support from all three members of Congress. But the stay was not granted. Instead, she was fitted with an ankle monitor and ordered to return to Guatemala in two days where she would not be eligible to apply for a visit to her children for ten years. Lawyers’ appeals got no response. For months churches and immigrant organizations in New Haven have been preparing for the eventuality of unjust deportation cases. Chavarria decided not to leave her children. Instead she sought sanctuary at the church. U.S. Sens. Richard Blumenthal and Chris Murphy, along with Rep. Rosa DeLauro, also came to the church to decry ICE’s decision as unjust and to pledge to continue to seek a stay of deportation on humanitarian grounds. Local clergy who formed the New Sanctuary Movement this year in the wake of Trump’s immigration policies helped prepare the rally. 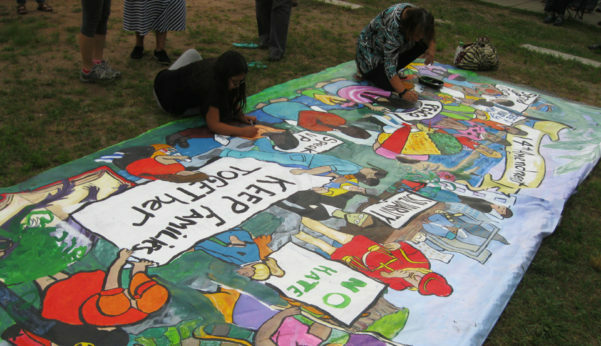 Before the vigil Hayley Chavarria and other children put the finishing touches on a giant banner provided by rePublicArt.org. Performers led everyone in song including Las Cafeteras who were in New Haven on tour from Los Angeles. Around the country, threats and fear of mass deportations are rising. The movement around Chavarria takes on added significance in this context. 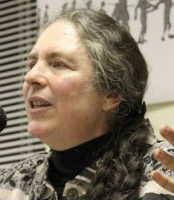 It is a product of the resistance to Trump along with years of consistent grass roots organizing for immigrant and workers rights by the Connecticut Immigrant Rights Alliance (CIRA), Unidad Latina en Accion (ULA) and other local groups. Kica Matos, national director of immigrant rights and racial justice at the Center for Community Change, lives down the street from the church and has been a leader with Chavarria’s case. Indicating that there are 13 other immigrants who have taken sanctuary at churches around the country, she told local media that the case of Nury Chavarria and her four children has received national attention because it has shocked the conscience of most Americans.